Is the incarnate Christ God Himself or God’s Son? This is really a problem most believers in the Lord do not understand. When the incarnate Lord Jesus came to do the work of redemption of mankind, God became the Son of man, appearing and doing work among men. He not only opened the Age of Grace, but also initiated a new age in which God came personally into the human world to live alongside man. With great adoration, the men who followed Him called the Lord Jesus as Christ, the Son of God. At that time, the Holy Spirit also bore witness to the fact that the Lord Jesus is the beloved Son of God, and the Lord Jesus called God of heaven Father. In this way, the notion of this Father-Son relationship was formed in the religious world. Now let’s think for a moment. Does God say anywhere in Genesis that He has a son? No. During the Age of Law, did Jehovah God ever say that He had a son? He did not! This proves that there is only one God, there is no Father-Son relationship to speak of. Now some people may ask: During the Age of Grace, why did the Lord Jesus say that He was God’s Son? Was the Lord Jesus Christ God’s Son or God Himself? You could say, this is a question that we believers have debated about throughout the ages. We sense the contradiction inherent in this issue, but we don’t know how to explain it. The Lord Jesus is God, but is also God’s Son, so is there also a God the Father? We are even less capable of explaining this issue. Over the past two millennia, there have been very few that recognized that the Lord Jesus Christ is God Himself, and is the appearance of God. Actually, there is a clear record of this in the Bible. In John 14:8, Philip asked of the Lord Jesus: “Lord, show us the Father, and it suffices us.” At that time, how did the Lord Jesus respond to Philip? The Lord Jesus said to Philip: “Have I been so long time with you, and yet have you not known Me, Philip? he that has seen Me has seen the Father; and how say you then, Show us the Father? Believe you not that I am in the Father, and the Father in Me? the words that I speak to you I speak not of Myself: but the Father that dwells in Me, He does the works. Believe Me that I am in the Father, and the Father in Me: or else believe Me for the very works’ sake” (Jhn 14:9–11). Here, the Lord Jesus said very clearly, “He that has seen Me has seen the Father.” As you can see, the Lord Jesus is the appearance of God Himself. The Lord Jesus did not say here that He and God have a Father-Son relationship. He just said, “I am in the Father, and the Father in Me,” and He also said, “I and My Father are one” (Jhn 10:30). Now, according to the Lord Jesus’ words, can we not confirm that the Lord Jesus is God Himself, there is only one God and there is no “Father-Son relationship” to speak of? Some people may ask, if the Lord Jesus is God Himself, then why is it that when the Lord Jesus prayed, He still prayed to God the Father? There is truly mystery to the Lord Jesus calling God of heaven Father in His prayers. When God is incarnated in the flesh, God’s Spirit is hidden within the flesh, the flesh itself is unaware of the Spirit’s presence. Just as we cannot feel our spirit within us. What’s more, God’s Spirit does not do anything supernatural within His flesh. So, even though the Lord Jesus was God become flesh, if God’s Spirit had not spoken and testified to God Himself, the Lord Jesus could not have known that He was God’s incarnation. So, in the Bible it is said, “knows … neither the Son, but the Father” (Mak 13:32). Before the Lord Jesus performed His ministry, He lived within normal humanity. He really didn’t know that He was the incarnation of God because God’s Spirit within the flesh did not work in a supernatural way, He worked within normal confines, just like any of us humans. So, naturally, the Lord Jesus would pray to the heavenly Father, which is to say, from within His normal humanity, the Lord Jesus prayed to God’s Spirit. This makes complete sense. When the Lord Jesus formally performed His ministry, the Holy Spirit began to speak and proclaim, bearing witness that He was the incarnate God. Only then did the Lord Jesus realize His true identity, that He had come to do the work of redemption. But when He was to be nailed to the cross, He still prayed to God the Father. This shows that Christ’s substance is absolutely obedient to God. Let’s read another two passages of Almighty God’s word to clarify our understanding of this issue. Almighty God says, “When Jesus called God in heaven by the name of Father as He prayed, this was done only from the perspective of a created man, only because the Spirit of God had put on an ordinary and normal flesh and had the exterior cover of a created being. Even if within Him was the Spirit of God, His exterior appearance was still that of an ordinary man; in other words, He had become the ‘Son of man’ of which all men, including Jesus Himself, spoke. Given that He is called the Son of man, He is a person (whether man or woman, in any case one with the exterior shell of a human being) born into a normal family of ordinary people. Therefore, Jesus calling God in heaven by the name of Father was the same as how you at first called Him Father; He did so from the perspective of a man of creation. 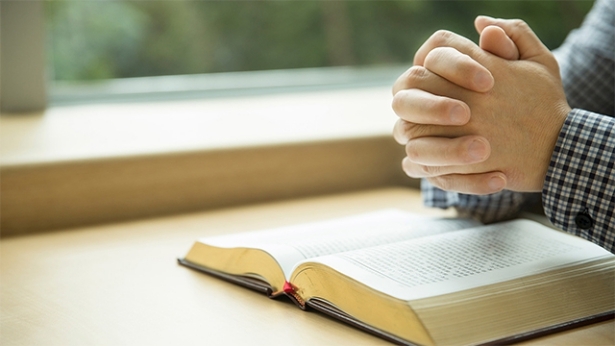 Do you still remember the Lord’s Prayer that Jesus taught you to memorize? ‘Our Father in heaven….’ He asked all man to call God in heaven by the name of Father. And since He too called Him Father, He did so from the perspective of one who stands on an equal footing with you all. Since you called God in heaven by the name of Father, this shows that Jesus saw Himself to be on equal footing with you, and as a man on earth chosen by God (that is, the Son of God). If you call God ‘Father,’ is this not because you are a created being? However great the authority of Jesus on earth, prior to the crucifixion, He was merely a Son of man, governed by the Holy Spirit (that is, God), and one of the earth’s created beings, for He had yet to complete His work. Therefore, His calling God in heaven Father was solely His humility and obedience. His addressing God (that is, the Spirit in heaven) in such a manner, however, does not prove that He is the Son of the Spirit of God in heaven. Rather, it is simply that His perspective is different, not that He is a different person. The existence of distinct persons is a fallacy! Prior to His crucifixion, Jesus was a Son of man bound by the limitations of the flesh, and He did not fully possess the authority of the Spirit. That is why He could only seek the will of God the Father from the perspective of a created being. It is as He thrice prayed in Gethsemane: ‘Not as I will, but as You will.’ Before He was laid on the cross, He was but the King of the Jews; He was Christ, the Son of man, and not a body of glory. That is why, from the standpoint of a created being, He called God Father” (“Does the Trinity Exist?” in The Word Appears in the Flesh). “There are still those who say, ‘Did not God expressly state that Jesus was His beloved Son?’ Jesus is the beloved Son of God, in whom He is well pleased—this was certainly spoken by God Himself. That was God bearing witness to Himself, but merely from a different perspective, that of the Spirit in heaven bearing witness to His own incarnation. Jesus is His incarnation, not His Son in heaven. Do you understand? Do not the words of Jesus, ‘I am in the Father, and the Father in me,’ indicate that They are one Spirit? And is it not because of the incarnation that They were separated between heaven and earth? In reality, They are still one; no matter what, it is simply God bearing witness to Himself. Owing to the change in ages, requirements of the work, and the differing stages of His management plan, the name by which man calls Him also differs. When He came to carry out the first stage of work, He could only be called Jehovah, shepherd of the Israelites. In the second stage, the incarnate God could only be called Lord, and Christ. But at that time, the Spirit in heaven stated only that He was the beloved Son of God, and made no mention of His being the only Son of God. This simply did not happen. How could God have an only child? Then would God not have become man? Because He was the incarnation, He was called the beloved Son of God, and, from this, came the relationship between Father and Son. It was simply because of the separation between heaven and earth. Jesus prayed from the perspective of the flesh. Since He had put on a flesh of such normal humanity, it is from the perspective of the flesh that He said: ‘My outer shell is that of a created being. Since I put on a flesh to come to this earth, I am now a long, long way from heaven.’ For this reason, He could only pray to God the Father from the perspective of the flesh. This was His duty, and that which the incarnate Spirit of God should be furnished with. It cannot be said that He is not God simply because He prays to the Father from the perspective of the flesh. Though He is called the beloved Son of God, He is still God Himself, for He is but the incarnation of the Spirit, and His substance is still the Spirit” (“Does the Trinity Exist?” in The Word Appears in the Flesh). Almighty God has expressed things so clearly. When the Lord Jesus was working among men, it was actually God’s Spirit clothed in flesh as a man working and appearing to man. No matter how the Lord Jesus was expressing His word or praying to God the Father, His substance was divinity, not humanity. God is Spirit, invisible to man. When God becomes clothed in flesh, man sees only flesh, he cannot see God’s Spirit. If the Holy Spirit had directly borne witness to the fact that the incarnate Lord Jesus was God, man wouldn’t have accepted it. Because, at the time, no one even knew what it meant for God to be incarnated. They just came into contact with God’s incarnation and had very little understanding. They never imagined that this regular Son of man would be the embodiment of the Spirit of God, that is, the appearance of God in the flesh. Even though the Lord Jesus expressed much of His word in the course of His work, brought man the way, “Repent: for the kingdom of heaven is at hand,” and manifested many miracles, fully revealing God’s authority and power, man at that time failed to recognize from the Lord Jesus’ word and work that the Lord Jesus was God Himself, that is, was the appearance of God. So what kind of understanding did man have of the Lord Jesus at that time? Some said that He was John the Baptist, some said He was Elijah. Others even called Him Master. So, God just worked according to the stature of people at that time, He didn’t make it hard for them. The Holy Spirit could only testify within the understanding of the people at that time, so He called the Lord Jesus God’s beloved Son, temporarily allowing man to think of the Lord Jesus as God’s Son. This way fit in better with people’s conceptions, and was easier to accept because, at that time, the Lord Jesus was only doing the work of redemption. No matter how people called the Lord Jesus, the important thing was that they accepted that the Lord Jesus was the Savior, had their sins remitted, and were thus qualified to enjoy God’s grace. So, God’s Spirit bore witness to the Lord Jesus in this way because it was more suitable to the stature of the people at that time. This completely fulfills the Lord Jesus’ words: “I have yet many things to say to you, but you cannot bear them now. However, when He, the Spirit of truth, is come, He will guide you into all truth: for He shall not speak of Himself; but whatever He shall hear, that shall He speak: and He will show you things to come” (Jhn 16:12–13). Despite the fact that we can’t see God’s Spirit, when God’s Spirit becomes clothed in flesh, God’s disposition, all that He has and is, His almightiness and wisdom are all expressed through His flesh. From the Lord Jesus Christ’s word and work and the disposition which He expresses, we can be entirely sure that the Lord Jesus is God Himself. The Lord Jesus’ word and work are full of authority and power. What He says becomes true, what He demands is realized. As soon as He speaks, His words become reality. Just as one word from the Lord Jesus was enough to forgive man his sinfulness and bring the dead back to life. One word calmed the wind and the sea. And so on. From the Lord Jesus’ word and work, we can see God’s authority and power, which rules over all things, and have seen God’s almightiness, wisdom, and wondrous works. The Lord Jesus expressed the way of repentance in His words, “Repent: for the kingdom of heaven is at hand.” He initiated the Age of Grace, concluding the Age of Law, expressed God’s compassionate and loving disposition and completed the work of mankind’s redemption. The Lord Jesus did the work of God Himself. The Lord Jesus’ word and work are the direct expression of the Spirit of God. Is it not proof that God’s Spirit came in the flesh to speak to and work for us, to appear to us? Could it possibly be that no matter how God’s Spirit speaks and works in the flesh, we are incapable of recognizing Him? Can this outer shell of the flesh really prevent us from recognizing the divine substance of Christ? Could it be that, when God’s Spirit becomes clothed in flesh to speak and do work, no matter how much we experience we would still be incapable of recognizing God’s appearance and work? If this is the case, then we are far too thick-headed in our belief. How else may we attain God’s commendation? Previous：Question 7: In the Age of Grace, God became flesh to serve as a sin offering for mankind, redeeming them from sin. In the last days God has again become flesh to express the truth and to do His work of judgment in order to thoroughly purify and save man. So why does God need to incarnate twice to do the work of saving mankind? And what is the true significance of God incarnating twice? Next：Question 9: You bear witness that Almighty God expresses the truth and is doing His work of judgment of the last days, but I believe that our belief in the Lord Jesus and acceptance of the work of the Holy Spirit means that we have already undergone God’s work of judgment. Here are the words of the Lord Jesus as proof: “For if I go not away, the Comforter will not come to you; but if I depart, I will send Him to you. And when He is come, He will reprove the world of sin, and of righteousness, and of judgment” (Jhn 16:7–8). We believe that, although the Lord Jesus did the work of redemption, on the day of Pentecost after He rose to heaven, the Holy Spirit descended and worked in men: “… reprove the world of sin, and of righteousness, and of judgment.” That should be God’s work of judgment in the last days, so what I’d like to seek is, what exactly are the differences between the work of judgment in the last days done by Almighty God and the work of the Lord Jesus?